Combining VARIMOT® D series variable speed gear units with reduction gear units of all designs in the SEW-EURODRIVE modular concept creates variable speed drives with a low output speed and high output torque. The combination of variable speed drives with helical, parallel shaft helical, helical-bevel and helical-worm gear units has proven effective at low speeds. The foot and flange-mounted versions can also be used to power machines without a reduction gear unit. Speed can be adjusted mechanically, e.g. with a handwheel, or electromechanically using a servo motor. 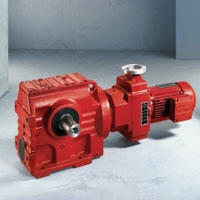 Multi-speed motors can be applied for further enlargement of the setting range of variable speed gear units. Series D VARIMOT® friction disk variable speed gearmotors are intended for power ranges up to 11 kW (15 hp) and speed setting ranges 1:4 or 1:5. The contact pressure between the driving pulley and the friction ring required for torque transmission is set automatically. The speed control can be adjusted even when the gearmotor is at a standstill. Purchase your SEW Eurodrive VARIMOT D series Variable Speed Gear Motor today!